Mark you calendar now for Hermitfest 2019 – September 7th, 2019. Vendors interested in exhibiting at the event should contact us at info@scenic4.org. We’ll update this page to reflect plans for 2019 as the date gets closer! Thank you everybody for your help in making our 2018 Hermitfest better than ever. The Ebbetts Pass Scenic Byway Association (EPSBA) will be hosting our 11th Annual Scenic Celebration on Saturday, September 8th, 2018. 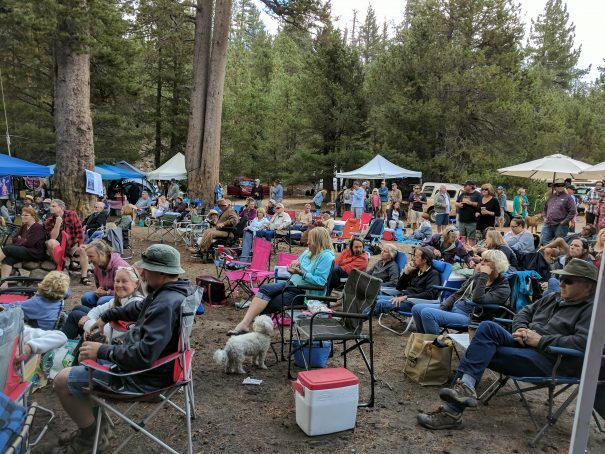 We invite all you music and mountain fans to “Come Party on the Pass” with us and enjoy one of the last free, outdoor, live music events of the year. 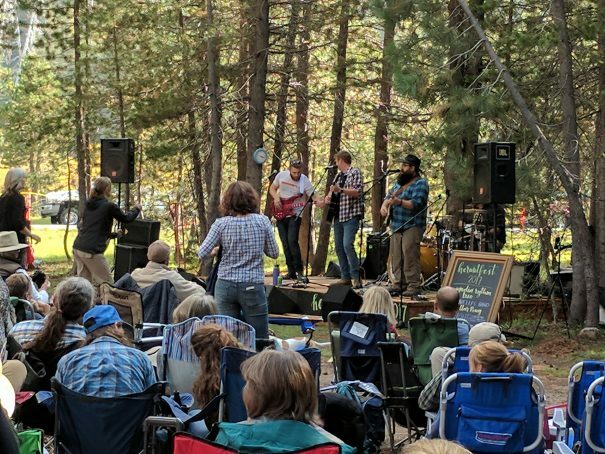 The centerpiece of our celebration will again be our day long, live music event in Hermit Valley which we affectionately refer to as “Hermitfest” but visitors should definitely make a weekend of it and spend some time checking out the entire Scenic Byway from Arnold to Markleevile. This year we’ll be enjoying the music of longtime Hermitfest favorites Bill Welles and Grover Anderson who have been with us from the very beginning. Ten Dollar Pony will be back again this year too. We’ll also be welcoming Jimbo Scott, Nathan Ignacia & Sambossa to the valley. The music begins around 11 am this year and will officially end at 8 pm but those of you who have attended before know that the music may continue around the campfires long into the evening. There will be food and beverages available for purchase. Tonja and Jana will be back with their locally roasted coffee, specialty teas, cold drinks and who knows what else! The work of a few local artisans will also be available for purchase. Weather permitting; we will have opportunities for stargazing with telescopes & experts available at around 9 pm to help us enjoy the stars, constellations, and stories of the night sky. 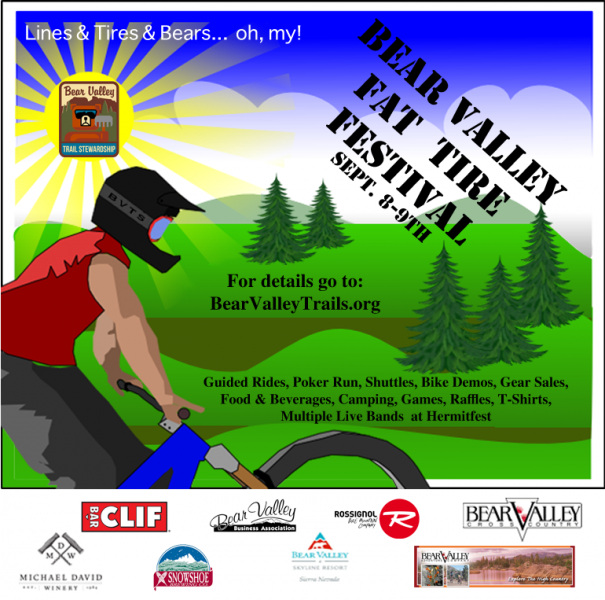 Bring your fat tire ride and join the Bear Valley Trails Stewardship for the best Fat Tire Festival on Highway 4. Experience some of the best mountain bike riding in the area. The weekend festivities will include guided MTB rides, shuttles to the high points of some of our best trails, bike demos, and gear sales, food and beverages (beer by Snowshoe Brewery), camping, games, raffles with plenty of swag. Contact BVTS to register at www.bearvalleytrails.org. Ebbetts Pass was honored with National Scenic Byway status in 2005. It is one of only seven nationally-designated byways in California. The Ebbetts Pass Byway Association is the non-profit organization tasked with preserving, enhancing and promoting the unique resources of the byway. The EPSBA had developed a guidebook for the area which is available on our website for those who want to know more about the history, geology, wildlife, and recreation available in the area. For more information about the Ebbetts Pass area, this event and what’s happening along the byway all year long, visit www.scenic4.org or www.facebook.com/Scenic4 or e-mail us at info@scenic4.org. We also want to thank the Calaveras Chronicle, other local media, Travis Branco (our poster designer) and the many other organizations who all help to promote this event. We especially want to thank Ron Schaner who coordinates and schedules the musicians for this event every year and is a tireless supporter of the byway. For other events in the area that weekend and lodging information, contact the Calaveras Visitors Bureau at 209-736-0049 (www.gocalaveras.com) or the Alpine County Chamber of Commerce at 530-694-2475 (www.alpinecounty.com). On the west side you can also visit www.bearvalley.com, www.cometoarnold.com and www.visitmurphys.com. This event takes place on National Forest Service land, and will operate under a special use permit in the Stanislaus National Forest.